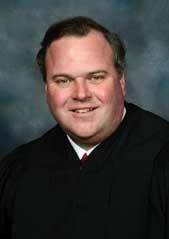 Justice David M. Ishee of Gulfport was appointed to the Mississippi Supreme Court by Gov. Phil Bryant. He took the oath of office on September 18, 2017. He previously served for 13 years on the Mississippi Court of Appeals, having first been appointed in September 2004 by Gov. Haley Barbour. Justice Ishee was born in Gulfport, Mississippi, in 1963. He graduated from the University of Southern Mississippi in 1985 with a Bachelor of Science Degree in History. He also attended the University of London and received his Juris Doctorate from the University of Mississippi School of Law. Upon graduation from Ole Miss, he entered private law practice with his late father-in-law, Elmo Lang of Pascagoula, Mississippi. He practiced for almost 14 years in the law firm of Lang and Ishee. During that time, he was involved in extensive litigation in civil, criminal, and domestic-relations law. He was appointed by the Circuit Court judges of the Second and Nineteenth Districts to head four death penalty defense teams and was lead counsel on numerous appeals and oral arguments before the Mississippi Supreme Court. He also served as board attorney for the Gulf Coast Regional Waste Water Authority from 1992 to 1996. In 1993, at the age of 29, he was appointed Municipal Court Judge for the City of Pascagoula. He was re-appointed for a second term in 1996. During this time, he also served one year as interim Municipal Court Judge for the City of Ocean Springs, and was Judge Pro Tem for the Jackson County Youth Court, where he presided over numerous child custody hearings as well as hearings involving abused and delinquent children. He was appointed Municipal Court Judge for the City of Gulfport in October 1999. He joined the law firm of Franke, Rainey and Salloum, PLLC, in 2002, where he represented local hospitals in medical malpractice cases and numerous businesses in general insurance defense. Justice Ishee is admitted to and has extensively practiced in all federal and state courts in the state of Mississippi, and is admitted to practice in the United States Court of Appeals for the Fifth Circuit. He has served as president of the Jackson County Young Lawyers Division, and secretary, vice-president and president of the Jackson County Bar Association. In addition to his participation on numerous committees of the Mississippi Bar, he was appointed as president of its Historical Preservation Committee. He was appointed by the Chief Justice of the Mississippi Supreme Court to chair the Criminal Section of the Model Jury Instructions Revision Committee, which revised the Criminal Model Jury Instructions for the Circuit Courts of Mississippi. He has also served as a special Circuit Court Judge and Chancellor in numerous counties by appointment of the Mississippi Supreme Court. Justice Ishee has served as President of the Southern Mississippi Law Constituent Society since 2010 and is a member of the Law Alumni Board of Directors for the University of Mississippi School of Law. He was inducted into the University of Southern Mississippi Alumni Hall of Fame in 2014, and as a Fellow of the Mississippi Bar in 2016. He teaches business law and professional ethics at the University of Southern Mississippi Gulf Coast Campus. He is also an adjunct professor at both the University of Mississippi School of Law and Mississippi College School of Law, where he teaches criminal litigation and trial practice. He previously served as an adjunct professor at Mississippi Gulf Coast Community College. He is a member of Trinity United Methodist Church, where he has been the conference delegate to the Mississippi Methodist Conference for eight years, and serves as an usher and a staff Parish Committee member. He is married to the former Linda Lang of Pascagoula. They have one daughter, Lauren. Justice Ishee is the son of Mrs. Doris Ishee of Gulfport and the late Representative Roger Ishee.